Reshma Saujani is stepping down from her position in Bill de Blasio's Office to explore launching her own campaign. 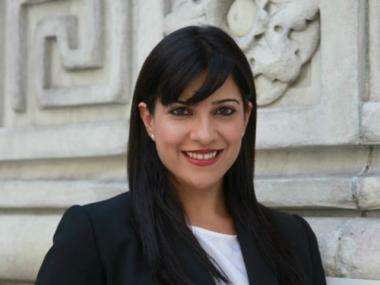 MANHATTAN — Reshma Saujani, the brainy beauty who lost her challenge to Rep. Carolyn Maloney in 2010, is stepping down from her position as a deputy in the public advocate’s office to mount a potential run to take her boss's place, sources confirmed Monday. Saujani’s departure, first reported by Crain’s New York Business, comes as Public Advocate Bill de Blasio gears up for an expected run for mayor against a crowded field that includes City Council Speaker Christine Quinn, Manhattan Borough President Scott Stringer and former City Comptroller Bill Thompson. Sources confirmed that Saujani’s last day will be March 16, after which she is expected to open an exploratory committee that would allow her to start raising funds. Sources declined to comment on which office Saujani was eying or whether she has made up her mind about running city-wide, but many have speculated that she is looking to take over from de Blasio if he indeed steps down. She is leaving on good terms, they said. Several popular officials are already rumored to be eyeing de Blasio's seat, including Brooklyn City Councilwoman Letitia James and state Sen. Daniel Squadron, who represents Lower Manhattan. Saujani, who rose through the Democratic ranks as one of Hillary Clinton's biggest fundraisers, mounted an aggressive campaign to unseat incumbent Maloney in the primary. She lost with just 20 percent of the vote, despite raising more than $1 million with the help of deep-pocketed backers like the mayor’s long-time girlfriend, Diana Taylor. Saujani, who co-hosted a star-studded fundraiser for President Barack Obama last week, did not respond to requests for comment. De Blasio declined to comment.